Rangers AFC is a south Dublin soccer club based in Terenure. Formed 1963 the football club was an instant success winning the 14 C division in the Dublin & District Schoolboys League. 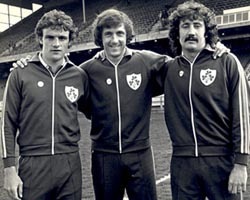 Former Rangers AFC players, Kevin Moran, Don Givens & Gerry Ryan in April 1980 ahead of an Irish international match against Switzerland. Rangers play their home football matches at the soccer pitches in Bushy Park in Terenure. The club's teams play in the Dublin & District Schoolboys League and the South Dublin Football League. A number of famous people have played for Rangers AFC over the years including former World snooker champion Ken Doherty. Terenure's rich rugby heritage has also crossed over into the soccer world in the form of Irish internationals Tony Ward, Eric Miller and Mick Quinn who all played for Rangers. Soccer players that played for the club and subsequently became professional footballers in England include John Cody (Chelsea FC), Pat Byrne (Leicester City), Don Givens (QPR), Gerry Ryan (Brighton & Hove Albion), and Kevin Moran (Manchester United). The latter three also played for the Republic of Ireland senior football team. The photograph to the right was taken ahead of a friendly match in April 1980 against Switzerland at Lansdowne Road (now Aviva Stadium). Moran, Givens and Ryan all started the match and it was Moran's senior international debut for Ireland. Don Givens scored the opening goal in a 2-0 victory for the Irish.